As the 71st anniversary of the bombing of Hiroshima and Nagaski approaches on August 6 & 9, please urging Congress and the President to reign in wasteful spending on a new generation of nuclear bombers, land-based missiles and nuclear submarines. Nuclear weapons production facilities create extremely long-lived nuclear wastes, and pollute our air and water with radioactive and chemical pollutants that are extremely hard to clean up. New York state taxpayers would have to pay a whopping $90 billion for the nuclear buildup over 30 years. We can better use the $1 trillion spent on this program for clean energy, public health, mass transit, and affordable housing, and create many more jobs in the civilian economy, instead of throwing it away on weapons we should not and must not ever use. PBS News Hour. Published on Feb 25, 2016. The Pentagon is preparing for an extensive — and expensive — modernization of the country’s half-century-old land, air, and sea-based nuclear weapons. Supporters contend a fully-equipped nuclear triad is essential for national defense and deterrence, but critics say it’s time to reexamine the extent of our arsenal in a post-Cold War world. Special correspondent Jamie McIntyre reports. 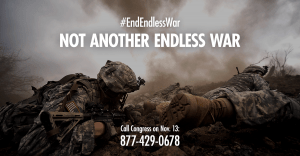 It’s not too late to stop an endless war in Iraq and Syria. We’ve spent over $1.1 billion bombing Iraq and Syria since August 2014, yet Congress has not debated or authorized our latest war. It will take grassroots pressure to move Congress. We can start by popularizing the possible steps towards a political solution. Instead of another endless war, Members of Congress should stand up in support of effective alternatives. Below are possible ways for the U.S. government to take action.